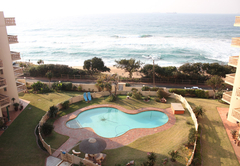 No 9 Umdloti is a highly recommended property providing self catering in Umdloti for up to 4 guests visiting the Umhlanga Coast region. 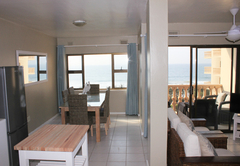 Located in the Umdloti Cabanas, this self-catering apartment is situated directly on the beachfront; you will not be disappointed with the location and the breathtaking ocean views. We pride ourselves in offering quality accommodation and our home from home comforts will make your stay with us stress free. The apartment has two bedrooms. 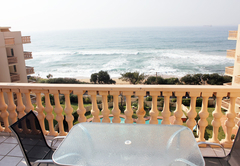 Both are on the second level of the apartment and both have wonderful sea views. 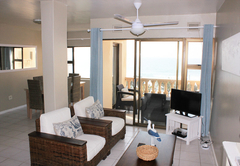 Both bedrooms share a verandah which is furnished with table and chairs. 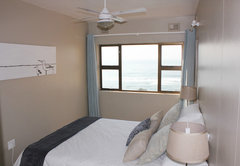 The main bedroom is furnished with a Queen size bed and the second bedroom has two single beds. There is plenty of cupboard space in both rooms. The living area is situated on the entrance level of the apartment and features a main living area, dining room and lounge. All these rooms also boast fantastic sea views. 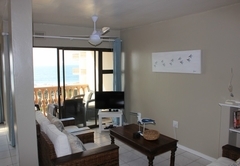 They link onto the lower verandah which is also furnished with comfy seating for dolphin spotting! The lounge is equipped with a flat screen TV, DStv and DVD player. 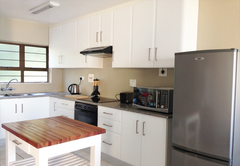 The kitchen is perfectly equipped for self catering with granite counter tops and a wooden butcher block. Braai facilities are provided on the large verandah. We do not provide bath and beach towels so please make sure that you bring your own. 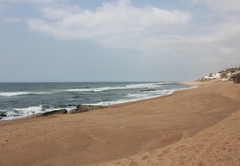 Umdloti is one of the best kept secrets of the North Coast. 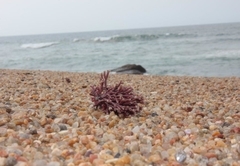 This quaint village offers beautiful beaches with its very own tidal pool. The warm Indian Ocean is associated with holiday, fun, swimming and relaxation. The apartment has two bedrooms. 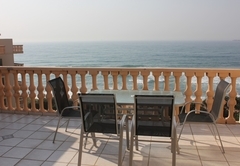 Both are on the second level of the apartment and both have wonderful sea views. 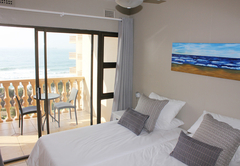 Both bedrooms share a verandah which is furnished with table and chairs. The main bedroom is furnished with a Queen size bed and the second bedroom has two single beds. There is plenty of cupboard space in both rooms. The place looks like it had some recent upgrade. Overall it's neat and clean, we had a wonderful stay and the weather was great. IF you all about surprises then this is the place, had an amazing stay, I will definitely be returning!!! The views from the apartment is great. Child policyChildren of all ages are welcome but please note we only sleep a maximum of four people, whether is it adults or children.